Oldcastle Infrastructure, part of CRH’s Building Products division, the largest building materials company in North America, was pleased to again take part in the 2018 Annual DCS Wilson County Foster Children’s Christmas program. Trina Hildabrand, DSC Event Coordinator, states, “For several years the foster children and youth of Wilson and Trousdale counties have been blessed by the generosity of the wonderful people at Oldcastle Infrastructure." Oldcastle Infrastructure, part of CRH’s Building Products division, the largest building materials company in North America, was pleased to again take part in the 2018 Annual DCS Wilson County Foster Children’s Christmas program. 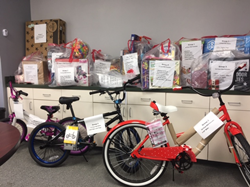 Lebanon, TN, Oldcastle Infrastructure employees helped gather toys and clothing items for children in the Wilson County Foster system. Our Lebanon team went above and beyond ensuring ten foster children, ranging from ages 3–17, would enjoy a happy holiday season. Building on a successful partnership with DCS Wilson County Foster Children’s program, our Lebanon, TN, plant donated time, gifts and financial support to this worthy cause. For more information, visit http://www.oldcastleinfrastructure.com. CRH is the leading supplier of building materials and products for residential, non-residential and infrastructure construction projects across the United States and Canada. CRH’s Americas Materials Division supplies aggregates, asphalt, ready mixed concrete, cement, and paving and construction services. CRH’s Americas Products Division supplies a broad range of value-added building products through its three primary businesses: Oldcastle Architectural, Oldcastle Infrastructure and Oldcastle BuildingEnvelope®. For more information visit http://www.crhamericas.com.